The Moon is void from 10:35 PM forward (until tomorrow at 5:30 AM). A Full Moon occurred yesterday. 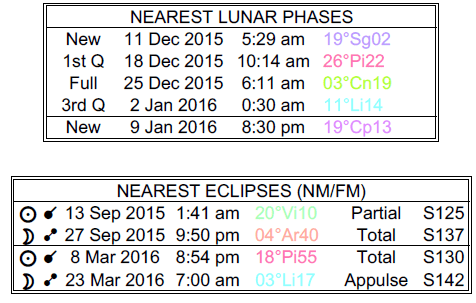 Mercury is in its shadow phase (Mercury will be retrograde from January 5-25, 2016). Uranus spends its first day in direct motion today. 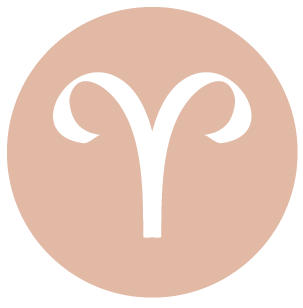 Uranus turns direct in your sign, dear Aries, and this week you can feel increasingly more in charge of making positive changes in your approach to life. For some of you, making friends or renewing existing friendships can be in focus now. Coming days are likely to be busy, but to avoid letting your life become scattered, focus on centering yourself today and tomorrow. Remind yourself of your priorities. 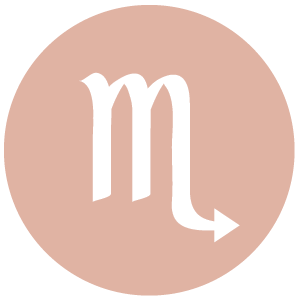 This morning, a Mars-Saturn conflict can stir up some feelings of resentment, particularly if you feel others are blocking your path or restricting you. The Cancer Moon tends to stir up a desire to stick close to home or with familiar people and places. Uranus turns direct in your privacy and soul sector, dear Taurus, awakening undiscovered feelings and urges. This week and in coming weeks, you’ll be increasingly confident about making changes, letting go of restrictive or negative attitudes and situations, and trusting in your own intuition. Patterns of behavior that are ineffective, limiting, or stale can be shed more easily now. Even if you get the feeling that your reputation is on somewhat shaky ground, you’re more confident that you can deal with it now. Today there may be delays to deal with this morning, but for the most part, there is good energy for communicating and connecting with others. Uranus has just turned direct, dear Gemini, and your spirit for making friends and developing friendship is renewed, although the next few days can bring unusual revelations in your social circle. This yearly event has been occurring in your sector of friendships, ideals, dreams, and wishes, and points to a stronger feeling of being in charge of making changes in these areas, rather than feeling at the mercy of changes others make. Travel or education plans might begin to move forward now as well. It can be difficult to get everyone to cooperate or go along with your plans this morning. However, much of today is good for centering yourself, getting comfortable, and shopping or enjoying comforts and pleasures. 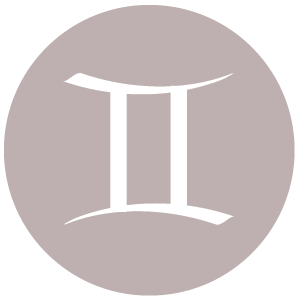 With Uranus turning direct, dear Cancer, the next few days can bring some surprising revelations about your career, life path, or reputation. The search for your own unique path is renewed – you’re looking to express your talents and individuality in the work that you do. Your ability to take personal and professional risks increases. Uranus direct in your career zone empowers you with a stronger sense that you’re in charge of making changes, rather than a feeling that changes are being forced upon you. This sense of being in control is likely to increase going forward. 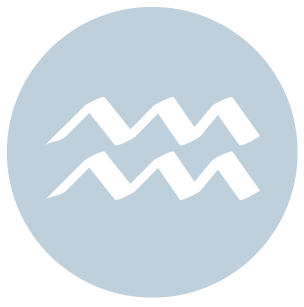 Today’s Moon is in Cancer, and the focus is on you, your personal plans, and your emotional needs. Aside from some possible grumpiness in the morning, the day should be good for pursuing your interests. 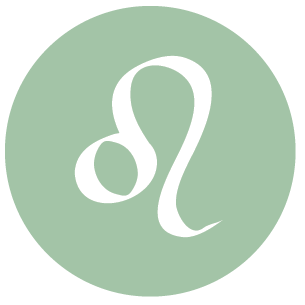 Today and in the coming weeks, you are likely to feel more inspired to practice your spiritual beliefs and to seek out new knowledge, meaning, and truth, dear Leo, with Uranus now in direct motion. This yearly event has been occurring in your adventure and learning sector. Close partnerships might also show signs of moving forward after a possibly stagnant time. There can be more clarity to your relationships and plans, even if there are unstable qualities to these in general. 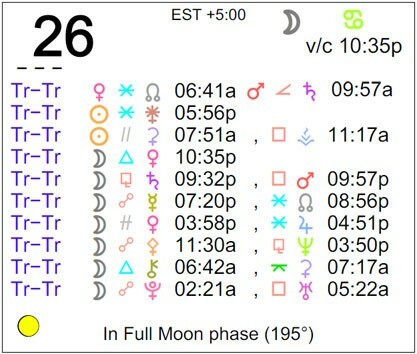 Today brings somewhat retiring energy, and with the Moon entering your sign tomorrow morning and starting a new lunar month, a pause that refreshes today makes good sense. 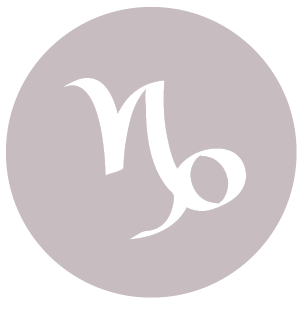 You are likely to learn something important about the past or revolving around information that was hidden, buried, or lost in the shuffle, dear Virgo, with Uranus reaching its yearly direct station. You might open your eyes to something very important today, particularly about a love relationship or a financial matter. While in recent months you may not have felt you had the necessary tools to deal with changeability and unreliability with finances or your intimate life, you’ll now feel more in charge, courageous, and ready to make changes, rather than feeling at the mercy of outside forces. This morning could be a little frustrating, as you could feel blocked. However, as the day advances, good energy is with you for taking things easy and for friendliness. 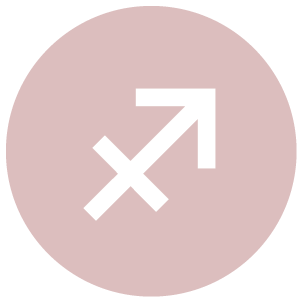 With Uranus now at its yearly direct station, dear Libra, you could learn surprising new things, or have a revelation, about close relationships, especially love and partnership connections. In the coming weeks, you can feel that a relationship or your attitude towards partnership is moving forward after a period of reflection, stagnation, or uncertainty. This can also be about a creative project or a relationship with children. You’re feeling more in charge of your life rather than at the mercy of changes others are making. This morning, there can be a tendency to say the wrong things, receive wrong directions or false leads, and to feel a little restricted or frustrated in your interactions with others. However, as the day advances, a general sense that others want to cooperate boosts your mood. 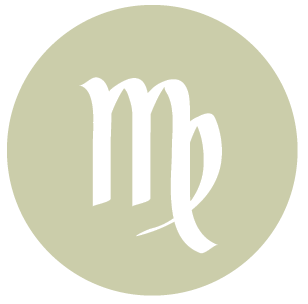 There could be changes or revelations about work or health matters today and this week, dear Scorpio, with Uranus at its yearly direct station. In the coming weeks, you’re more inclined to feel strong or courageous about making changes that pave the way to progress and improvement, rather than feeling overwhelmed or at the mercy of outside forces. You can feel a little more in charge of making changes at work or with your daily routines. Family and home matters can also move forward now after a period of being on the fence. Today’s Cancer Moon helps you to see the big picture. 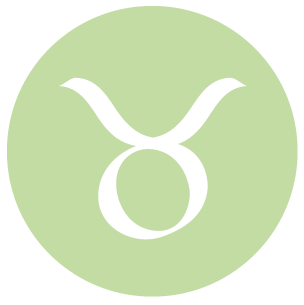 A Mars-Saturn conflict this morning may prompt some restlessness, as you could be feeling restricted from going after what you want, but as the day advances, it’s easier to see the good in your life and find much to enjoy. Uranus has now turned direct after many months of retrograde or apparent backward motion, dear Sagittarius, and this yearly change of direction stimulates changes in romantic and creative pursuits for you. More importantly, it empowers you with the feeling that you are in charge of changes, rather than at the mercy of them. You are feeling freer to express yourself with spirit. Unpredictability in your romantic life is certainly a theme now, and it’s not likely to go away anytime soon, but you are more willing to take action when it comes to freeing yourself from stale patterns of relating. Creative and learning pursuits, as well as personal interests and projects, begin to move forward. Decisions surrounding these things tend to be more straightforward. 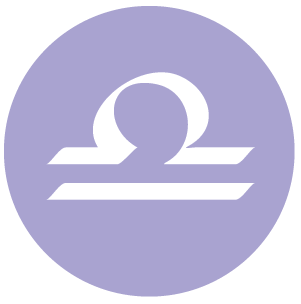 Uranus, the awakener, has now turned direct, dear Capricorn. This yearly event has been occurring in your home and family sector in the last few years, and will continue to do so for the coming three years. This can bring revelations, surprises, and new thinking revolving around home and family life this week. Increasingly, you’ll be feeling more in charge or confident that you’re making important progress and changes that free you from negative or limiting situations or patterns of relating. Courage is building after a period of some self-doubt or uncertainty. Financial affairs could also move forward – a business deal or idea might be renewed. For some time, you’ve been learning to express yourself and your ideas more spontaneously and openly, dear Aquarius, and you might often experiment with new ways of thinking, learning, and communicating. This process serves to open up new worlds to you – and possibly new opportunities – as Uranus spends time (years) in your communications sector. Uranus has now turned direct and this yearly move can increase your confidence. There is more clarity in your life, direction, studies, and communications. There can be renewed interest in projects and some of you could be reconnecting with friends this week. 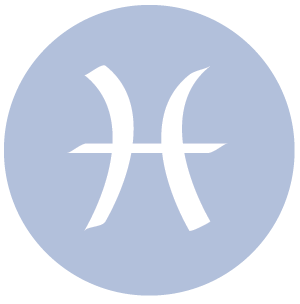 Now and in coming weeks, your spirit for making changes in your approach to business or making money is renewed, dear Pisces. You’re also more courageous when it comes to defending yourself and what you believe you’re worth. Projects may be moving forward now, but perhaps more importantly, you feel more in charge of making changes rather than feeling that changes are happening to you, particularly related to money matters. It’s a good time to develop talents and attend to your money and valuables. 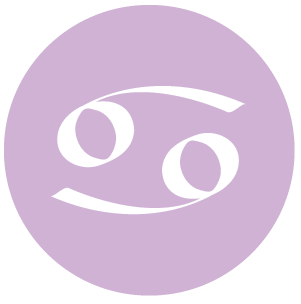 Today’s Cancer Moon enhances your sign nicely, and you find it easier than usual to enjoy and express yourself. 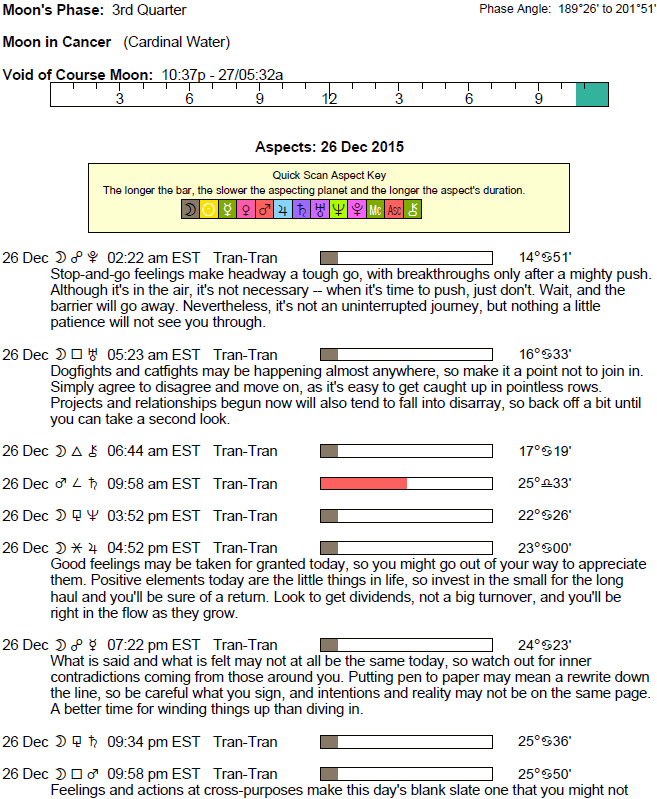 If Your Birthday is December 26th, If Today is Your Birthday full horoscope here. A buried or frustrating issue can now come to a head. Something from the past or that was previously hidden can surface. There can be intensity in our relationships or emotional turbulence within. Complex feelings and entanglements can be issues. The need to let go of something could emerge. Wait for the tension to subside before taking action. We can be at odds with one another over a mental or intellectual matter, belief, or idea now. It takes extra effort to understand one another. There can be difficulties focusing or knowing where/how to direct our energies. For some of us, we may bury ourselves in work as a way to avoid other problems now. We are taking pride in our relationships. It’s a good time to strengthen and support others, and to build trust. We tend to instinctively know how to behave in ways that boost others’ confidence. This can be a pleasantly ambitious period. This can be a time when we are more agreeable, or come into the company of people who we harmonize with, connect well with, and who tend to be good for us. We might feel we are lucky with money or in affairs of the heart. Fortunate connections might be made now. We are generous, forgiving, and high-minded now. We are looking at people and situations positively. This is a good time for making plans. A buried or frustrating issue can now come to a head. Something from the past or something that was previously hidden can surface. There can be intensity in our relationships or emotional turbulence within. Complex feelings and entanglements can be issues. The need to let go of something could emerge. Wait for the tension to subside before taking action. Opportunities will arise for you to express your intuitive and artistic nature. We are sociable, making connections, dipllomatic, and ready to negotiate. Expressions of affection or clarifications of feelings. You will be a powerful leader in your chosen career and may use your profession to feel powerful. You may experience major upheavals in your work environment. Sabian Symbol: A man unmasked. Cnj 17°Aq35 SUALOCIN Tantalising but naive. Sun 29° Aries 43' 54"
Moon 08° Scorpio 08' 30"
Mercury 03° Aries 36' 35"
Venus 29° Pisces 18' 05"
Mars 13° Gemini 03' 55"
Saturn 20° Capricorn 26' 15"
Uranus 02° Taurus 21' 48"
Neptune 17° Pisces 43' 02"
Chiron 03° Aries 28' 35"